It had been thought they could count towards the recommended 150 minutes of moderately intense activity per week. But the BMC Public Health study, which surveyed over 4,500 adults, found those who counted housework were heavier than those who did other activities. Experts said activities only counted when they made breathing more rapid and the heart beat faster. NHS recommendations do say housework does not count towards the 150-minute goal. But the researchers in this paper say there has been a move towards promoting a "lifestyle approach" to physical activity - encouraging "domestic" activities in people who may not take part in sports or go to the gym. And they warn that, while any activity is better than none, people should be aware that they still need to meet the moderate activity target on top. Participants completed a detailed interview about their activity levels, whether they played any sports or did formal exercise as well as their diet and smoking and drinking habits. They were particularly asked about activity linked to looking after their homes. Your exercise should make you breathe harder, feel warmer, and make your heart beat faster than usual. Domestic housework in 10 minute bursts or more accounted for 36% of the reported moderate to vigorous physical activity people said they did. 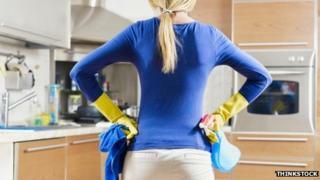 But when weight and height were taken into account, researchers found that those who counted housework as exercise were heavier than people doing other exercise for the same amount of time. Among women, just a fifth reached the weekly exercise target if housework was discounted. Chris Allen, senior cardiac nurse at the British Heart Foundation, said: "Your exercise should make you breathe harder, feel warmer, and make your heart beat faster than usual. "So, unless your household chores tick all these boxes, they won't count. "If you're daunted by the prospect of a 150-minute target, think of it in 10-minute chunks. "It doesn't necessarily mean forking out for a gym membership either - try a brisk walk on your lunch break or make a resolution to take the stairs rather than the lift each morning."